As a dry yearling and the first time out in 2005, Butterfly picked up her first championship. 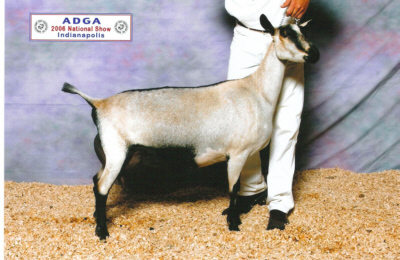 In 2006 as a first freshening 2 year old, she easily picked up her other two championships. Butterfly is one solid doe. She is very wide through out and a big boned doe. She’s not a tall doe. She is very level on the top line and ideal in rump, being wide and level. She has depth of body and spring of rib. She has good feet and excellent strong pasterns. Her udder is her best asset and it is extremely attached. She has a very smooth fore udder and a strong medial attachment. Her rear udder is exceptionally wide. Butterfly tracks straight and is wide between the hocks. We would like to smooth her shoulder bladed, as they do not blend into the withers. Butterfly peaked at 14.5 pounds in 2007. Butterfly freshened with a single in 2008. Her milk record was not what we where expecting. She peaked at 11.8 pounds in 2008. Butterfly also took ill after a tick bite in 2008, and she is still recovering. She is still beautiful.